This is a monoprint/collograph. It is one of a kind. 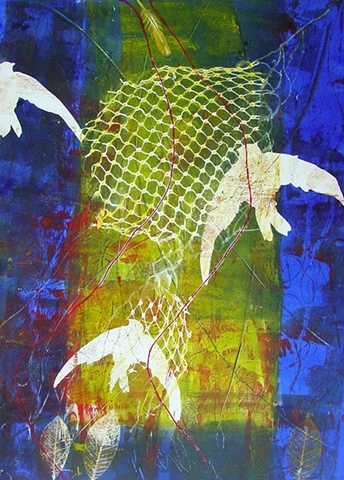 Of this particular piece, I did a second collograph, which is called the ghost print, Swallows II. It is a manipulated print of this collograph, but also unique. I moved the swallow shapes showing a "ghost" of the images from the first run through the press. I also moved the red line and the leaves. This makes them a complimentary pair!